Good Intentions. I’m full of them! There are so many tips, tricks and recipes that I’ve been meaning to share with you. So many photos that have been sitting patiently on my hard drive, waiting to be paired with recipes, with stories, or at the very least a few words of explanation. So many recipes that have been written, tested, and tasted that are just waiting for that perfect photo. I never write what I plan on writing when I plan on writing it. It just doesn’t work that way. I don’t work that way. I can tell myself that I want to share my mom’s Potato Leek Soup recipe, I can take photos of it, I can even begin to write about it. But it just won’t be posted until it’s ready to be posted! I really can’t even explain how my process works. Some days I just feel like writing about certain things. But when I have ideas, I try to at least put them down on paper (you should see the piles of notepads that are scattered throughout my house!) so that someday, when I’m good and ready, I’ll get around to it. Well, back in June, I decided that I had to talk to you about lettuce. There are a few things that I think everyone needs to know about how to wash, dry, and store lettuce. I thought it was so important that I actually took a series of photos so that I could show you exactly what to do with your lettuce. But, instead of sharing my tips about lettuce, I ended up writing about the lime and mint salad dressing I made that same day. And then I just sort of moved on and the lettuce photos have been sitting and waiting ever since. So now it’s October and the food blogs are soon to be filled to the brim with pumpkin cheesecakes and apple pies but here in Sicily, summer is still hanging on. And today, finally, I’m going to talk about lettuce. So you can file this away until next summer or you can keep eating salads all year long. Either way, I hope it’s helpful! How often do you eat green salads at home? Is it a rare occasion? Do you buy lettuce at the store with the intention of making salads, forget about it, and then find a wilted mess in your veggie bin a week later? Do you try to solve the problem by buying the expensive pre-washed, bagged lettuce? Are you disappointed with the quality of that lettuce? Ok, that’s a lot of questions. But I know that many people like to eat green salads with dinner but don’t. There could be many reasons for this but it’s usually related to time (or the lack of it). “Who has the time to wash and dry lettuce,” you might say, “and why bother? It wilts before I have chance to use it anyway!” You might have solved the problem by buying the pre-washed stuff and realized that not only is it expensive but the quality isn’t always that great. So, increasingly, it seems that dinner salads are more of something to be enjoyed at restaurants. Washing and drying lettuce doesn’t have to be that difficult and if you do it correctly, it can stay fresh and ready to be used for up to two weeks! That means that if you’re willing to give up maybe 20 minutes, once a week or every two weeks, you can have a ready supply of crisp, fresh lettuce that is ready to throw in a bowl at a moment’s notice. I have a lot of kitchen gadgets, some get used, some just take up space. Most are convenient but not essential. But the one thing in my kitchen that I really don’t want to live without is my salad spinner . A salad spinner is simply a contraption that dries your lettuce for you. But I really don’t think there is a quicker, more effective way to dry lettuce. And if you want to make a salad, there’s nothing worse than wet lettuce, except maybe wilted lettuce but we’ll get to that part soon! I can’t stress this enough. If you don’t own a salad spinner and you enjoy eating salads, you need to buy one. That’s it. I don’t say things like this very often but I feel like it’s worth the money. There are different brands and different types, I don’t care which one you get. Watch out though because some of them are designed so that the water drains out the bottom and can only be used inside the sink. I prefer one that can be used wherever I want to use it. I’ve had the OXO Good Grips Salad Spinner for about six years now and it’s been wonderful. Don’t spend an exorbitant amount of money on a salad spinner, it doesn’t need to be stainless steel like the $50 version I just saw on Amazon. You should spend about 20 bucks for a quality salad spinner that will last. So, after you go out and pick up the greatest kitchen gadget ever invented, you will need only two more things to keep your lettuce fresh and extend it’s life longer than you could ever imagine: gallon-size plastic bags (preferably zippered) and paper towels. That’s it! So this is how I wash, dry and store my lettuce so that it is fresh and ready for salad whenever I need it! I use this method for all types of lettuce (except iceberg, see the end of this post for information about cleaning and storing iceberg lettuce) and it also works for other types of greens and hearty herbs such as parsley. 1. 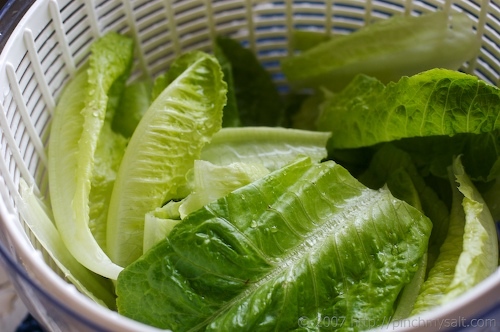 Fill a sink with cold water, separate all the leaves of lettuce, place them in the water and swirl them around. If the lettuce is a bit limp, let it soak in the water for 30 minutes and it will miraculously come back to life. 2. Drain the water, turn on the faucet, and briefly rinse each piece of lettuce as you remove it from sink and place in the basket of your salad spinner. If you use organic lettuce, just give each piece a quick once-over to check for clinging bugs and dirt. As you put the lettuce in the spinner, you can tear the leaves in half if they are large (such as full-size romaine). 3. When the spinner is full but not tightly packed, spin the lettuce until dry. 4. Spread two paper towels (still connected) on the counter and pile the dry lettuce in the middle. 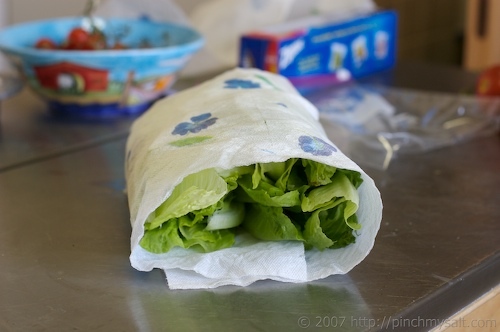 Wrap the paper towels around the lettuce and slide into a gallon-size zippered plastic bag. Squeeze the air out and close the bag. 5. The lettuce can now be stored in the fridge and should stay fresh for at least a couple of weeks. You can take out what you need whenever you want to make a salad or sandwich and then just reseal the bag. The plastic bags can also be reused! Notice I said that the above method works for all types of lettuce besides iceberg? That’s because I don’t separate and wash the leaves of my iceberg lettuce. They are so tightly wrapped that the dirt doesn’t have a chance to get all the way inside. 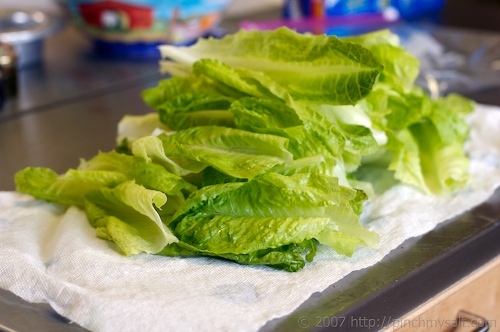 For iceberg lettuce, remove and discard the outside layer of leaves, rinse the whole head of lettuce well under running water, shake it dry (water can work it’s way inside when you rinse it) and wipe excess water off with a towel. Wrap the entire head in a paper towel, place in a plastic bag, and store in the fridge. 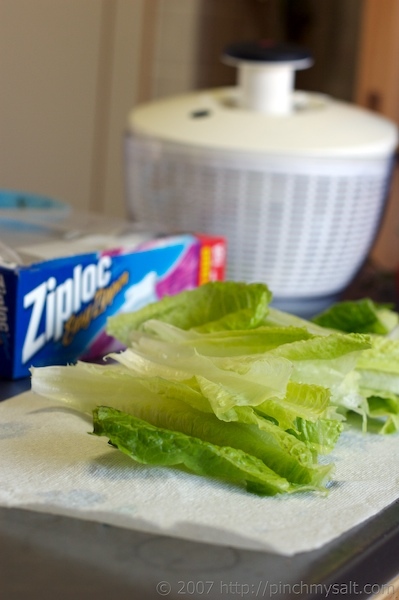 Pull off leaves or cut off chunks of lettuce as you need them, rewrap remaining lettuce in paper towel and return to plastic bag. Iceberg will keep fresh for a very long time if you store it correctly! Now that you have this nifty new way of storing lettuce, what should you do with it? Make salads, of course! I usually buy two or three types of lettuce at once to add a little variety to my salads. If you wash and dry the lettuce as soon as you get home from the store, you’ll find that it’s simple to throw together a side salad to go with dinner anytime you want. Salads don’t have to be fancy to be good. Just by using a couple different varieties of lettuce (even just a mixture of green leaf and iceberg), you’ve already got a good start towards an interesting salad. My standard dinner salad is lettuce, shredded carrot and cucumber. How hard is that? From there I might add a little red cabbage, corn, chopped apple, raisins, and/or sunflower seeds. Sometimes I throw in some cherry tomatoes. It just depends. Once you have the lettuce ready to go, the hard part is over. Have fun and be creative! These are just a few of the many, many possibilities. It only takes a few ingredients to make a great salad but you can add as many as you want. The only rule I try to stick to is the more color, the better! Just like the salad, dressings can be as simple or as complicated as you want them to be. Sometimes all a salad needs is a squeeze of lemon, a drizzle of olive oil and a sprinkling of salt and freshly ground pepper. If your salads of the past have been little more than a vehicle to get more ranch dressing in your mouth, try putting together a salad that has flavors of it’s own and you’ll be less likely to want to drown it. Ranch dressing is great, but save it for a once-in-a-while treat (try making it from scratch when you do eat it). There are plenty of tasty and healthy options! Experiment with different vinegars and use good olive oil, soon you won’t miss the bottled stuff from the store. But if you do have a particular bottled brand you like (I love Girard’s Champagne dressing), by all means use that! Nicole, a great salad recap and yes, we eat leafy greens all winter (ditch the tomatoes). The salad spinner should be a mainstay of every kitchen...I have the OXO with the "brake" to stop it from spinning! This is exactly the way I store my lettuce, too. Another trick for refreshing lettuce that you haven't stored this way is to separate the leaves and stand them up in a bowl of water (the same way you'd store freshly cut herbs, or flowers). Water is absorbed through the cut end, and after a short time the leaves perk right up! My mom just got me to do this a couple of years ago, however I was just washing it, spinning it, and then storing it. I didn't know about soaking the lettucs in water for 30 mins if it's limp. That's handy! I also have the OXO spinner with the brake and my kids love to help me wash lettuce. Also, I didn't know to store iceberg in the manner you described. It gets such a bad rap but sometimes I just really love an iceberg wedge salad. Thanks for this post! It has a lot of helpful info. Peter: Mine has the brake too! :-) Lydia: That's a good idea to stand it up in the water...I've always just thrown it all in the sink to let it soak and sometimes the ends won't stay under water! Evie: It was my grandmother that first taught us to store lettuce this way. It really makes a huge difference! I know iceberg lettuce gets a bad rap but I think it's mostly because for a long time, that was the only type of lettuce many Americans ate. I've always loved the crunch and flavor of it on sandwiches (it does have flavor even though some try to say it doesn't!) and sometimes an iceberg salad with ranch or creamy blue cheese is the only thing that will do! I have been meaning to get a salad spinner forever, but haven't yet. I think you've just persuaded me!! I am a huge believer in cleaning and cutting veggies when I get them home from the market. If I don't, I become too lazy when I actually need them, and they go to waste because they weren't clean and ready to use in a pinch. What an informative post!! I've been mulling over it but you have convinced me that I need a salad spinner. Will go looking in the shops this weekend. I like storing washed leaves in a Lock & Lock box, it has a "freshness tray" that I find very useful. I totally understand about an awkward, interesting writing process. No idea how to explain mine either:). The worst is when I starting, mentally, writing posts in the middle of the night or sitting on the sidelines of a soccer game. Hello, uh, brain? Could you focus on the task at hand and more importantly: remember this in the morning? The great part is that the writing keeps coming: and yours is great! Cheers! Yeah, I saw this episode of Good Eats also. However, your details are much better then a 22 minute episode. This is the same salad spinner i have and I love it. I also store my lettuce this way! I also have the smaller version of the salad spinner, which is perfect for herbs. At least one of my salad spinners gets used nearly every day. Thanks for the reminder about that creamy feta dressing, which I've been meaning to try. Hey Nicole You have posted this on right time:), I always get confused type of lettuce to buy n what goes with it n finally I go to costco n end up buying mixed greens n store bought dressing.... I know couple of simple dressings, you have posted really good ones. Thanks a lot. I'm going to try these. What an inspiring post, Nicole -- words, photos, the whole salad, so to speak! Tommy: I've never heard of a Lock & Lock Box, I'll have to google it ;-) Have fun shopping for your salad spinner! Janelle: That happens to you, too?! It drives me crazy sometimes when blog posts start writing themselves in my head when I need to be concentrating on something else (like sleeping)! I'm glad I'm not the only one! Jason: Unfortunately I never get to watch Good Eats but I'm sure it was a good episode :-) Kalyn: I know that you're also a big proponent of the salad spinner :-) I haven't tried the feta dressing for a long time. I remember Peter at Kalofagas tried it and made some adjustments. Check it out. Padmaja: I didn't mention it in this post but one of my favorite types of lettuce for salads is butter lettuce (or Boston or Bibb lettuce). There are lots of good store bought dressings out there but it's fun to experiment with homemade ones :-) Katiez: Good idea keeping the lettuce in the salad spinner except it's so big, I don't have room for it in my fridge all the time! I like the plastic bags because they are compact enough to fit in my veggie drawer along with other produce! Great tip Nicole. I always get lazy and just leave the lettuce in the salad spinner, but it ends up taking up half the fridge. I'll give the bagging a try . . . thanks! LOVE YOU for posting this. Thank you so much! It will change my whole eating life. Would you believe years ago I threw out a salad spinner? Hmm. Nicole, great info. I too have a tested and tried Oxo salad spinner and you're right, everyone should get one. Here's what I do, after washing and spinning all the lettuce, in the salad spinner, I layer the bottom of the spinner with double sheets paper towel, then one set of lettuce and continue this until the spinner is filled (with layers of paper towels and lettuce). Then I cover (not wtih the spin top cover) the spinner and store it at the bottom of my fridge and the lettuce remains very crisp for up to 2 weeks and sometimes a little more. I kept a salad spinner for a long time but last year I traded its space in cupboard in favour of getting a rice cooker! We use that 2x/week (not just for rice, either) but I still need to dry lettuce FAST, at least 2x/month. So this is what I do now and because it's so "interesting-looking", a few of my neighbours have learned and adopted the technique: 1 - Place washed, rinsed greens on a large, clean, dry towel on the counter. 2 - Gather up the towel corners etc. so that you end up with a sack of greens. 3 - Hold SECURELY CLOSED with your hand(s) and fling the whole thing in a little arc into your sink, or your bathtub/shower, or (like me) outside or anywhere you feel comfortable with the water ending up. 4 - It's important not to let the towel (and consequently your greens) go as you do this! It's the small, easy tip that makes all the difference. :-] You'll see the water forced out through the sack by the centrifugal force, same thing that makes the salad spinner work. Open up the towel on your counter and use or store the greens as usual. Hope this helps anybody who can't or won't spare the cupboard space for a salad spinner -- There is still no reason not to have wonderful fresh lettuce available always. You're exactly right - a salad spinner is a vital piece of kitchen equipment. It's cheap and worth every penny. 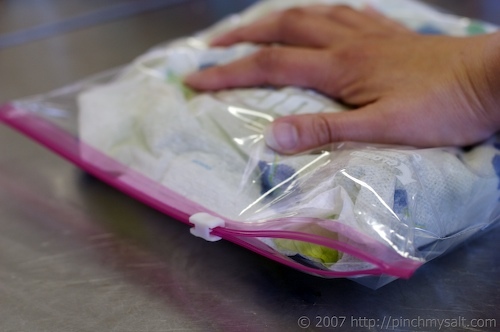 I wash and dry my leaves, wrap in paper towel and then store in normal plastic bags - using a ziplock bag is a great idea. Years ago, while studying I worked in an organic food shop. We very quickly learnt about refreshing greens in cold weather. Works particularly well for mint too. It's a useful tip, especially during steamy summer weather. I have an old salad spinner - looks like an egg beater except where an egg beater has blades that mesh together the salad spinner has a metal bowl with small holes. I hold it by the red handle, turn the crank and the bowl spins around shedding the water. Makes me smile everytime I use it. However, a few years ago a friend taught me her trick which is especially good if washing a large amount of lettuce for a big party or the next two weeks. She puts her lettuce in a clean pillowcase, puts the pillowcase in her washer and sets it on spin for a little bit. Every leaf comes out dry and pristine ready to be dressed. Thanks for this great tip. I'd read in a cooking magazine that the best way to keep lettuce was to store it in the salad spinner. It may be good for the lettuce, but who has room for a salad spinner in the already crammed refrigerator? I like your method. I think that one of the most wasted foods in my kitchen is lettuce because of the tendency it has to turn to slime. You have given me hope! thanks. Hi.. Thanks so much for the instructions. I have a question though. When I spin my lettuce, its an OXO Spinner, it never gets completely dry. Am I doing something wrong or are the paper towels meant to absorb whats left of the water? If thats true, won't the paper towels keep the moisture around the outside lettuce? These are probably silly question ,but I truly don't know how to properly fix the lettuce. Thanks! No need for one of those expensive spinners if you're on a budget.... Rinse everything in the sink, then put the greens in a clean pillowcase in the washing machine on "Spin" cycle. Works great every time, especiallly for a big party. Just turn the pillowcase inside out and wash it next time you do laundry! Just the "Rinse" is enough! Don't beat everything to death! Man..I dont know where i can store another gadget :~) I have never seen shredded red cabbage at the store have you? thanks so much for these ideas, even though im apparently a few years too late!! we have our first garden this year, planted about 3 packs of leaf lettuce seeds, now weve got lettuce growing out our ears. we are so glad to get your ideas, we didnt know you can store lettuce so long! we always got bagged lettuce, that went bad so fast. we appreciate this so much! keep up the great site! Thank you so much! I've perused many recipes online but never came across any good tips for washing/drying lettuce. I've thrown out so much lettuce over the years... it makes me sick! I'm going to go buy the salad spinner tomorrow and try it out. When rinsing the iceburg lettuse, do you take the core from the top before rinsing. Thank you so very much! I live alone, except for my cat. He really doesn't care much for salads so I've been batteling with trying to keep lettuce fresh. I can't wait now to go out tomorrow, get some lettuce's, do as you've said and finally eat salads at home again! Thanks again. I just bought a head of iceberg lettuce. No spinner but will do the paper towel thing. Now, here's a question. Have you ever been to a Ponderosa Steak House? Their lettuce is sooooo good! It's crunchy and actually has a bit of a sweet flavor to it. Any idea what they're doing to get that iceberg lettuce so tastly? Thanks again. Love your site! I read this article last fall then I went and bought a salad spinner, not an Oxo but you said any one would do. Since then I've used your method of drying lettuce and storing it faithfully. My last batch lasted much longer than two weeks. I used the lettuce until it was all used up and I think it lasted more than a month. I buy groceries monthly and just purchased another mess of green leaf. So it's just been soaked and is in the colander waiting for me to spin and wrap with the paper towels. I use green bags and squish all of the air out and am now looking forward to another month of crisp fresh lettuce. Thanks so much for your instructions. I wouldn't have had a clue without you! I read a wloe lot of sites about storing lettuce and this was definitely the best - I use iceberg almost all the time and this gave the the answer as well as tips to get me more into the other types. Wonderful. OMG thank U sooooo much for this tip. I can't tell U how much money we waist on lettuce. I am going to try this asap. Once again thanks and keep the tips coming. I just bought five heads of romaine and followed this guide, only with a couple of minor changes that I hope won't spoil all of my beautiful greens! Instead of ripping the leaves if they were too big to put in the salad spinner, I chopped up all my lettuce as if I was about to eat it. Was this my first mistake? Should I try to leave the leaves intact as much as possible? 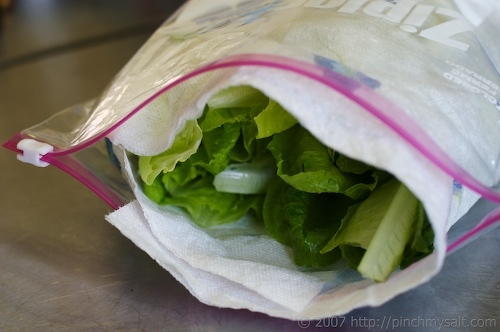 Then instead of wrapping the leaves in paper towel and sealing them in ziplock bags, I just put a clean towel down in the biggest tupperware container I own, filled it up with the chopped/cleaned/and dried lettuce, covered it up with the ends of the towel, put the lid on, and threw it in the fridge. I'm assuming this will have a similar effect of wrapping the leaves in paper towel and putting them in sealed bags, just as long as I haven't already ruined my lettuce by chopping it up. Anxiously waiting to see how long it will last. Great article, Thanks! How long will the salad be good for after doing this, right now i buy my salad i rinse it off in cold water then i put it in a zip lock bag i might be lucky to have it last 4 days then it usually is brown. Thanks for the Tip! I'm going to try this! @Sarah Johnston.....When I followed these steps, my lettuce lasted well into a fourth week. I don't use lettuce all that much. Was pleased that it held up that long. Thank you so much for posting this. I have been trying to eat healthier and one of my biggest problems is that the lettuce would go bad after a few days. Unfortunately, I do not have time to go to the market every 2 days to replace lettuce that went bad. If you have any other tips for keeping other produce fresh (mushrooms, tomatoes in particular), I would love to hear about it. @Darrin.....I use the green bags for fresh produce that will keep them fresh for over a week. I've even used them for meats when I've had to split packages. They do work. Thank you for that fantastic information about how to keep lettuce fresh. My dad just brought over some fresh rocket, spinach and butter lettuce straight from his garden and I had no idea how to store it. I too have a salad spinner and I agree, everyone has to have one of these. It is definitely the best tool in my kitchen! I followed these instructions to a T and yet when I opened my lettuce this morning (I washed and dried them last night) they were already wilting and gross. How dry is the salad spinner supposed to get the lettuce? Because mine didnt get it completely dry no matter how long I spun it for. Help please!!! Any suggestions for someone who does not use paper towels? Will a regular kitchen towel be a good substitute? Hi Erin, I haven't tried it myself, but I would think that a clean dish towel would work fine. Please let us know if you give this a try. I spent most of my life hating salads and anything that had lettuce on it because 99% of the time the lettuce in question was iceberg: ugh! A few months ago my best friend recommended that I try green leaf lettuce and I am in LOVE! I buy 1-2 heads a week and eat a salad almost every day, but I still end up throwing some out. I guess a salad spinner is the answer! Anyone have some recommendations? I've started looking around online and keep seeing comments about strings and gears breaking so I'm wary to just go out and buy the first one that I see. Trisha.......I recommend buying one at Bed Bath Beyond. Their return policy is fantastic. I have had something break a year after purchase and they take the return....even without a receipt....and let you exchange! There is an Oxo with a stainless steel bowl. Mine has a plastic bowl instead of the steel one they have now. Looks the same otherwise. What I like is the push knob on top. I have had mine a couple of years...maybe 3... and it still works like a charm. It does cost more, but worth it to me. It gets great reviews on their website, for what that's worth. Good luck! This is SO helpful! I have been trying to eat healthier and I do like salads but I could not for the life of me figure out how to keep my lettuce from dying! Thanks for the tips! Loved the info and will try it! Seems I jusr get it home and it crawles out of the bag under its own power! This is all fine and good but all the rinsing and spinning in the world wont get off the green worms or aphids. They hold on tight. Only thing that I'v found that works is a soak in salt water or maybe vinegar water. Thank you so much for this. Growing up we rarely had salads. Unless you count fruit salad smothered in sugary this, that, or the other. Needless to say I was a bit clueless about salads when moving out but I found I love salads. What I don't love is buying a head or bag of lettuce and having it wilt and get gross within a day and a half. I have started to grow as much as I can in containers, but in the winter it's not quite an exact science yet. So store bought will have to do. Now it'll actually last! We have the OXO spinner and only used it once in a long while when we made a proper salad for two or more. I used your tips more than a week ago and except for the outer leaves and small edges, the head of romaine lasted over a week which is unheard of since normally it's just nasty by that time. Now we're out and I'm using the iceburg method for the buy one get one free heads we just bought today. Thanks! Also it was so nice throughout the week to just grab what I wanted and to eat it right away! BRILLIANT !! I'm really stoked that I found your site.I've had a spinner in my kitchen cupboard for years, the make is a Zyliss which has a pull cord that makes it spin. Thank you for your advice. Another tip I found was how to keep Celery for at least 3 weeks was to cut the base (root end) off and trim into sticks you have to cut the leaves off. Take the sticks and wrap in aluminium foil. I put 3 in at a time (I'm a single guy) and it really works. Once again thanks a mil for the tip Kind Regards, Terry. Wonderful post, and great advice! We just stopped buying "bagged lettuce" and have switched to your method and are loving the fresh difference! When you guy iceberg lettuce, never cut the core out with a knife, hit the core on the cabinet or something hard, then work it out. I have found that a knife is a culprit to any kind of lettuce. it makes it turn dark. hope this has helped. Thi? post provides clear idea designed fo? the nnew people of blogging, t?at truly ho? to do running a blog. 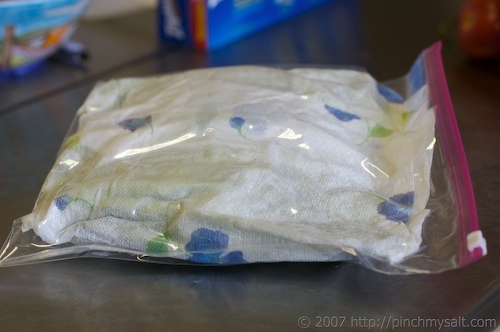 I use a salad spinner to wash the lettuce and dry the leaf lettuce on the counter with paper towels for a few minutes, and enclose the lettuce inside a zipper baggie with paper towels. Just as you described. However, within 3 or 4 days, I start to get black spotting on my lettuce and I don't understand why this happens. I have always cleaned my lettuce this way and it never lasts as long as you post. Is there something else that can be done to make it stop with the black spotting and the edges of my lettuce collecting this black type mildew??? This worked so well so I wanted to say thanks. Here in Spain we were finding that the lettuce that we purchased from the local market was only lasting a few days. With your tips, although I did dry the lettuce by hand as we do not have a spinner, the lettuce was good to eat a week later. I didn't waste a single leaf! PLEASE dont rinse lettuce in the kitchen sink. Bacteria in the sink can make you sick. Wash it in a colander or clean bowl! You can keep celery for a long time by wrapping it in aluminum foil. It will stay crisp for several weeks. Just upwrap and take off what you need and rewrap. Just confirming that no salad spinner I've tried gets it completely dry, even after 3 sessions. If yours does, do tell. I try to reuse the paper towels too, there's nothing wrong with them. Pure, thin cotton kitchen towels work well if you don't like paper towels. Tim in Spain: I've heard of "spinning" lettuce to dry by whipping it around inside a cotton pillowcase! Good way to get kids involved in the kitchen. I like to store my salad in the spinner. I have a Zyliss. I just move 2 gallon containers from the top shelf to the door to make room. Then I can get a quick salad snack easily. Stays nice and fresh. Sometimes I cut up tomatoes and put in Baggie and store on salad in spinner, so I grab some lettuce and tomato. I have used a spinner and the paper towels in a plastic bag for many years. My mother used to wrap the lettuce, after washing, in a clean linen dish-towel, which I have also done. But you cannot find linen dish towels anymore! Cotton ones work, too. I agree that it's difficult to find linen towels these days! I have found some cotton/linen blend that are nice, but not quite the same! When someone is simply looking for the best way to keep lettuce fresh, that’s what they want to read about. Unfortunately, as with posts such as this, one must scroll through page after page of completely useless information posted by a complete stranger before eventually getting annoyed and hitting the back button to find a post that actually contains the info you’re looking for without having to read someone’s entire back story that may or may not eventually lead to some actual information. If you want to be writer then be a writer but don’t waste everyone else’s time with your cute analog please. I realize you probably think that everyone on the internet just can’t wait to hear all about you and the details of your past situations but I’m sorry to inform you that they do not. Stick to the facts please.